Yes, we saw birds in Maine but not as many as we had hoped. 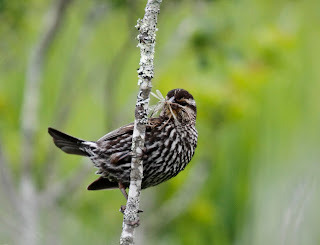 We took field trips to the main(e)land to see birds that pass through Philly during migration but nest in Maine. We saw one of this and two of that. For the most part, we heard warblers more than saw warblers since they were mostly buried in the tall, dense forest. Here are a few photos. 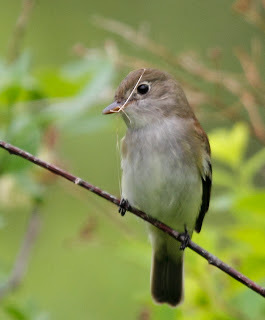 The first photo is Alder Flycatcher which you usually can't identify by sight since it looks so much like a Willow Flycatcher (in fact, they both used to be called Traill's Flycatcher until recently). This photo shows a full eye ring which is pretty diagnostic of Alder - the Willow doesn't have it. I also thought this was a funny photo due to the grass making a loop around the bird's head. She was obviously making her nest nearby. 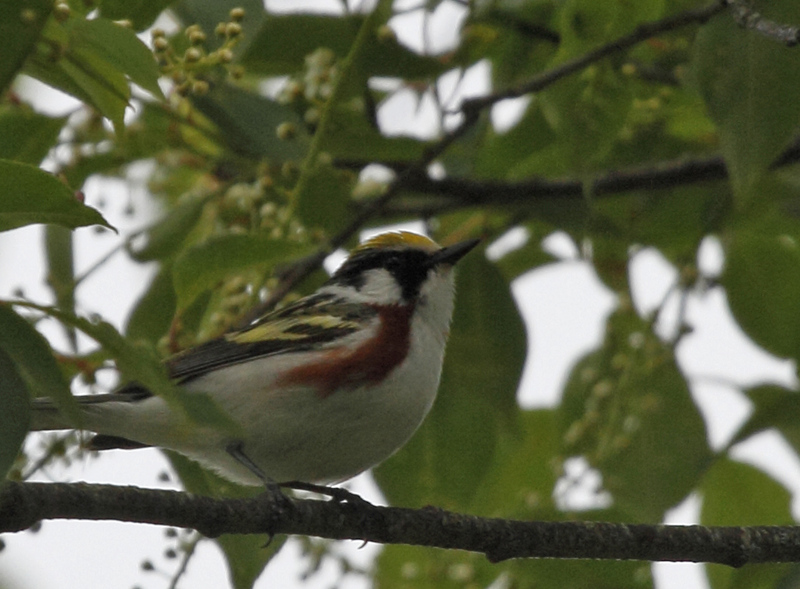 This next bird is Chestnut-sided Warbler which is just a fantastic looking bird. It is named for the chestnut blotches on it's side, but could just as easily be called the yellow-crowned warbler or masked warbler or any number of other names. This is the best photo that I have of the bird. 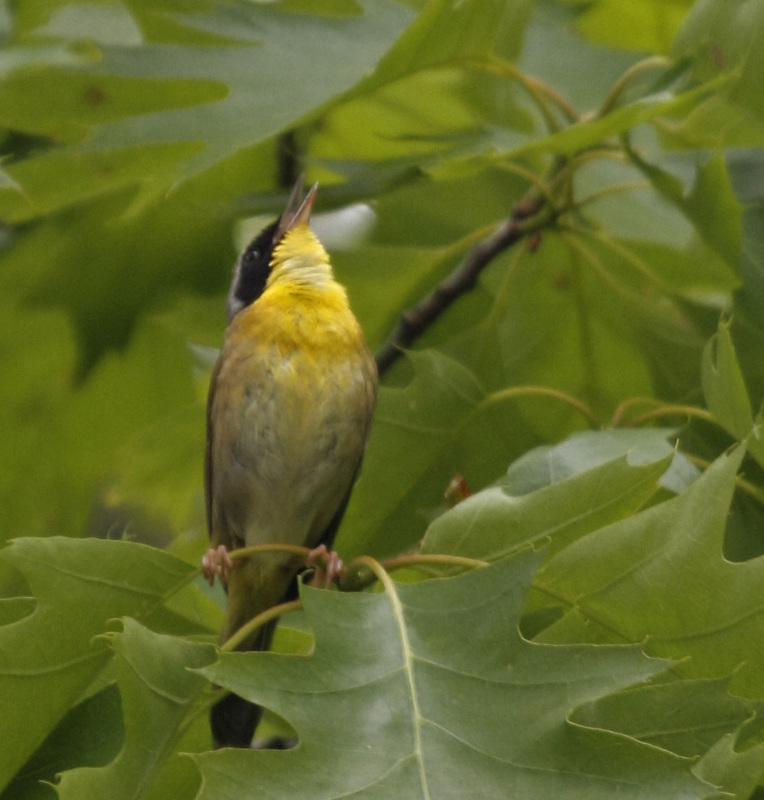 Here is Common Yellowthroat. 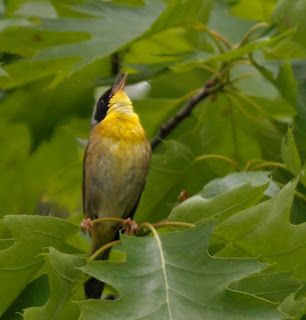 Again, this bird could be called Masked Warbler or something else but this photo shows that yellow throat pretty well. This guy just hauled off with songs right in front of us for about 5 minutes. Here is a female Red-winged Blackbird. She looks alot different from the male. 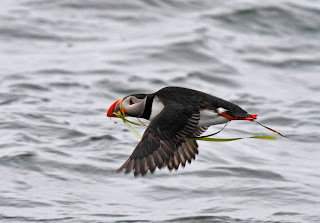 Here she is with nesting material. One of the few birds that we saw on the trip that was rare for us was this Vesper Sparrow. I need one of these for the Big Year Stupid Contest. Unfortunately, this one doesn't count since I saw it in Maine. He liked to sit on top of this rock in the blueberry field. 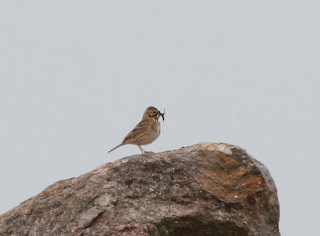 I think his nest was nearby since he disappeared under the rock with this bug soon after the photo was taken. 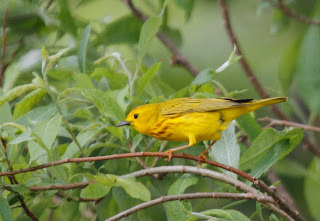 A very common bird for us is Yellow Warbler. Their song is "sweet, sweet, sweet, little bit sweet" which you can hear any time you walk near any kind of water. Here is a male that posed for us along one of our walks. We took boat trips out to the rock islands in the Gulf of Maine to see seabirds that only come ashore to nest. 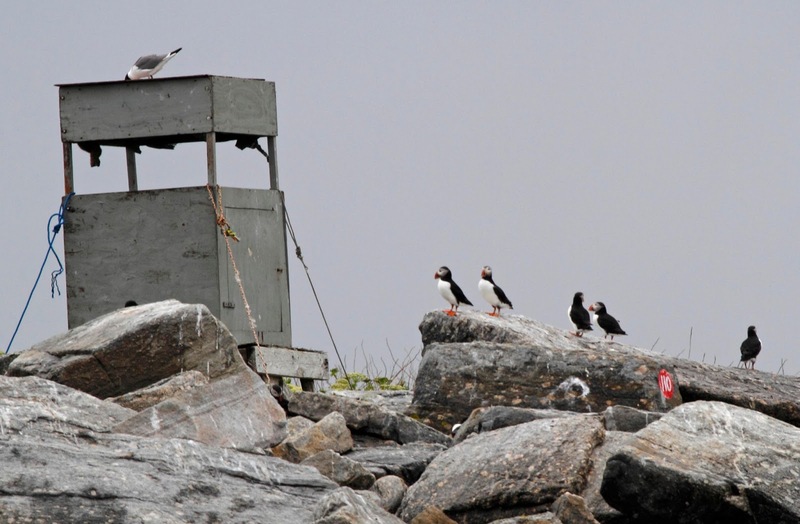 We hiked on small islands to see birds too. 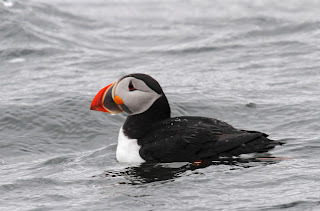 The star of the show had to be the Puffins. 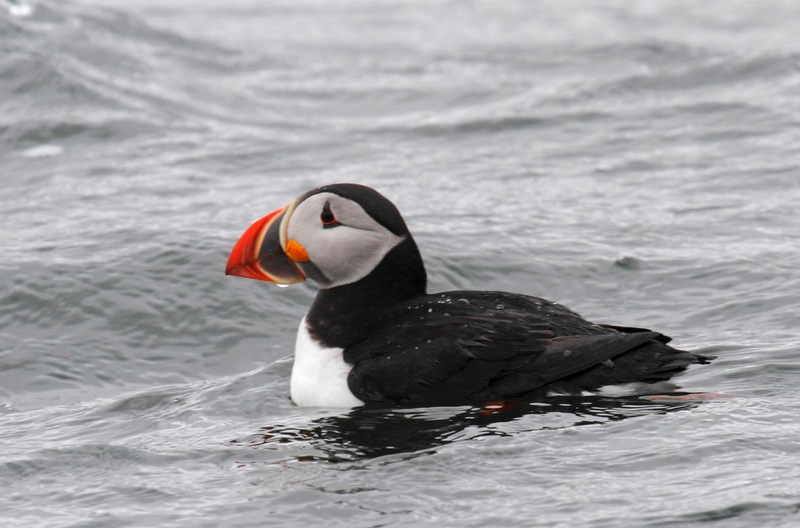 We saw about 2 dozen Puffins around Egg Rock Island which is where they nest. Most were bobbing around in the water or sitting on the rocks. Here are a few pretty good photos. The weather was pretty yucky - overcast and drizzling most of the trip so the photos aren't the best. Here are 2 shots of Puffins with grass in their beaks to make their nests. They nest in burrows under the rocks on the island so I guess the grass makes it cushier. 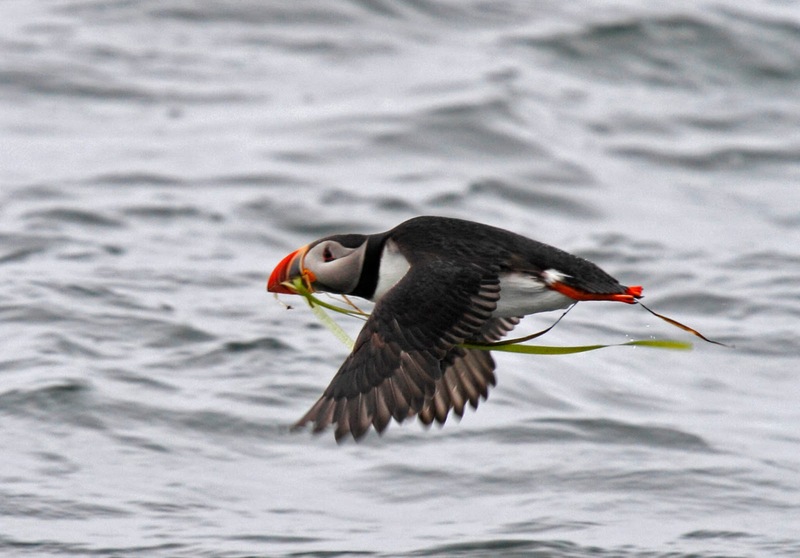 This is the best photo that I think I'll ever get of a Puffin. I couldn't believe it turned out this well. Check out the big orange feet. Here is a shot of the island. 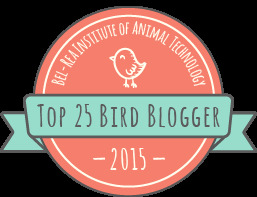 The structure is a bird blind which is used by interns as they monitor the nesting. The interns keep tabs on the chicks etc. 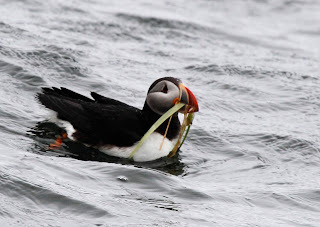 You can see that the 5 Puffins don't mind it at all. It looks like they are lined up for to go into a photo booth or something. I have other bird photos that I'll post later. OK, Bird Lady...Time to come home!